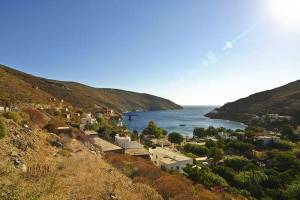 You will enjoy driving around Serifos, since there are many interesting routes. 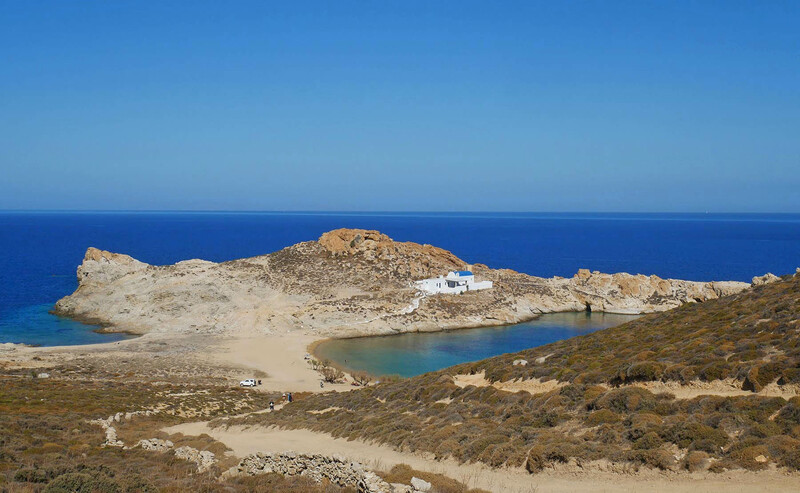 In some of them you will discover the amazing landscapes of the inland and in others you will pass by the beautiful beaches of the Cycladic island. A.1. From Livadi to Chora. The main road from the port towards Chora (5Klm) is full of hairpin turns. 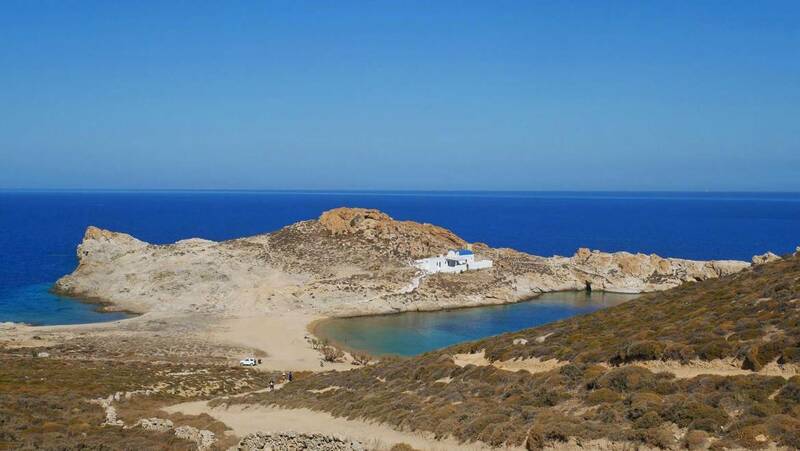 This route offers a beautiful view of Livadi initially and then it continues through the barren landscape with the “petrified forms”, that according to mythology have been scattered all over the island during Perseus times. As you go further up the hill you will see Chora standing magnificent. At the col you can find the 3 out of 9 windmills of the island. A.2. From Chora to Megalo Livadi. The route from Chora to Megalo Livadi is 15.5Klm and is a road full of twists and turns. It extends in a large mountainous part of the island and passes through amazing and wild landscapes to end at the southwest coast. While driving and after you leave Chora behind the mountainous landscape spreads in front of you with the slopes being interspersed with walls of dry-stone and small stone houses. After the first 3Klm, turn left at a crossroad to Koutalas-Megalo Livadi (if you turn right the road leads to Panagia, Sykamia, Pyrgos, Galani, Kallitsos). In the next few kilometres, both on your left and your right, there are dirt roads that lead to Agios Panteleimon, Panagia Kamaroti and Liomandra. On your road to Liomandra, at about 2.2Klm, you will find another dirt road leading to Avessalos beach, while before you lies Koutalas bay. The conical hill that rises above Koutalas bay is the “Grias Castle”. Just before you reach the crossroad to Megalo Livadi (at about 2 Klm) and on your left at Koutalas, you can find the ruins of the “White Tower”. Driving towards Megalo Livadi on your left hand you can see the settlement Megalo Chorio (or Mia Horio). A sedimentation of the ground that occurred swept away many of the building of the area and has caused the large pit that you see. These days, only some ruins remain and some newer buildings that stand further up at the slop, as well. However, during 1880 until 1912, the village had tailors, grocery stores and two hospitals- one of which was lost during the sedimentation of the ground. In this area was found the rare green quartz that is exhibited at the Mineral Museum in Paris. Shortly after Megalo Chorio, on your left, you can find the crossroad for “Psaropyrgos”. Kelia (cells). The housing cells were built in stone, some were whitewashed while some were not and were surrounded by stone walls. You can still find them scattered all over the island. In this houses used to live the farmers while performing the agricultural activities in the countryside. There were also the wine cellars (krasokelia), located near the vineyards and were used for the storage of wine and for the grapes processing, the hiding cells (kleftokelia) which were located in isolated canyons and were used for protection from the pirate raids, and finally the dovecots. B. Livadi-Vagia-Ganema-Koutalas. A bountiful driving route of 9klm, connects the port with the souther beaches of the island. The route with the beautiful view passes over or sometimes next the beaches, in some of which you can find some nice taverns. After passing trough Livadakia and Ramos, at Alonaki area there are three dirt roads. The left one leads to Spathi lighthouse, and the right one serves as the main road that connects the southern regions. While passing over the Kalo Ampeli Bay and going further down the hill you can find three marvellous consecutive beaches, Vagia, Ganema and Koutalas. The crumbling building at the entrance of Koutalas used to be the offices of the “Seriphos-Spiliazeza” company. In addition to the offices, the elementary School was housed in the second floor of the building. At that time, the area had four grocery stores and several urban coffee houses where the 220 permanent residents used to gather. As it was described in the Farnks’ Mapps, the bay was named Porto Cadena and took its name after the thick chain that was used to be tied between Aspros Kavos and Vagia, preventing the entrance of the unwanted visitors to the bay. As you continue driving towards Megalo Livadi, you can see the iron-made loading ladder, that has been preserved since the times when the mines used to operate. while leaving Koutalas bay the surrounding view of the iron-coloured, filled with caves slops is very atmospheric. As you drive further up, you can see Malliadiko beach and in about 6.5Klm you will reach the crossroad from where, either you continue straight ahead and you reach Megalo Livadi or you turn right and the road will lead you to Chora (20.5Klm). C. Livadi-Kalitsos-Panagia. A tour around the northeast part of the island. This road passes by the most beautiful beaches of the island, the magnificent Monastery of Taxiarches and some small villages. While leaving the port, you must take the coastal road. At the end of the road continue further up, on your left, towards the direction of the biological treatment. On your left hand you shall find the dam of the island. Driving a few meters down you shall see the small sign for Lia and Agios Sostis. The road continues with twists and turns for about 2.7Klm, while you pass by the stunning beaches of Psili Ammos and Agios Giannis. After 7.9 Klm of driving through the mountainous landscape, you shall get to Kallitsos (or Ken darchos) settlement that has a beautiful beach below it. 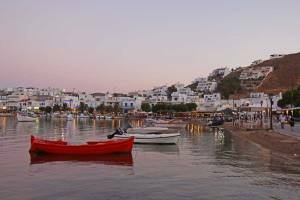 The settlement having its houses and its dovecots spread at the hill makes it one of the most beautiful villages of Serifos. It has been built during the revolution of 1821. 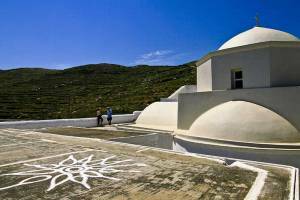 From there you can enjoy the view at Sifnos, Kythnos and Serifopoula. If you continue driving to the north side of the island, which used to have many vineyards in the past , in about 1.5 Klm you shall see the impressive church of Panagia Scopiani on your right. The beautiful bay further down is Platys Gialos. Driving 1Klm further you shall reach the monastery of Taxiarches. In 3Klm further you shall see the white houses of a small settlement called Pyrgos. From there, in about 500m there is a sign that lads towards Sykamia and at 200m is located the beautiful village Panagia. It is worthy walking to the small square of the village with the homonymous church, which is a landmark for the island, as it is the oldest church in Serifos (built the 10th century). If you continue driving for 6 more Klm and after you pass through the crossroad for Koutalas-Megalo Livadi, you will end up at Chora.